In the 45 years Dave has been a folk musician, he has played every kind of venue including bluegrass festivals, folk festivals, corn and apple festivals, chili cook-offs, wakes, weddings, grand openings, fiddle contests, state and county fairs, wineries, museums, campfires, square dances and 4th of July parades. Fiddling has always been a part of the fabric of American life. 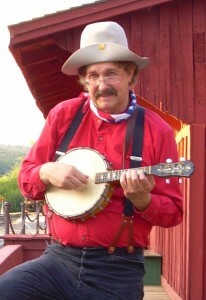 Dave is a member of The New Christy Minstrels (since1997). Their shows have been greatly received with capacity crowds and standing ovations everywhere they perform. His first show with them was at the grand opening of the Burl Ives Museum in Washington DC. Dave appeared with the Minstrels in the acclaimed PBS television special ‘This Land Is Your Land’. He was a founding member of the original old time string band The Piney Creek Weaselsand has also performed with The Foothillbillys, Horse Sense, The Black Irish Band and Michael Martin Murphy. 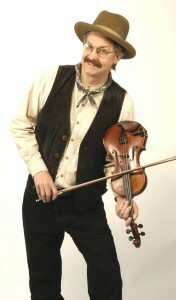 Dave currently performs in his own solo shows ‘Musical Treasures From The Gold Rush Era & America’s Frontier Days’ and‘Catgut Strings & Rattlesnake Tales’ and also with Mark Twain actor Pat Kaunert in the show ‘Way Out West in 1861’. As a fiddler he played in over 50 competitions, winning top honors in many, including a blue ribbon at the nation’s oldest and largest fiddle convention in Galax, Virginia in 1993. 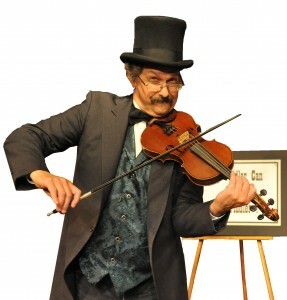 With Dave, you are guaranteed to enjoy championship fiddling and be entertained by someone who loves the rich tradition and heritage of America’s folklore and musical roots.